Long-range target precision and hunting in low-light conditions. 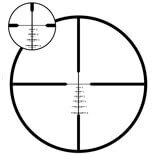 An exceptional, high-performance riflescope for precision target shooting, long-range varmint and predator work and big game hunting where the extra light gathering ability of a 50mm objective is desired. MeoTrak TRZ target turrets (4.5-14x50 T) are easily and quickly resettable to zero. A convenient side parallax adjustment guarantees accuracy from 30 yards to infinity. Field of View: 25.5' - 5.7' @ 100 yds.